This year, enjoy your holiday meals while keeping your eye on a healthful lifestyle and a slimmer waistline. Perhaps you've just been diagnosed with diabetes or you simply don't want to pack on added pounds during the holidays. You need not fret. There are plenty of healthful ways to preparing your Thanksgiving and Christmas meals. 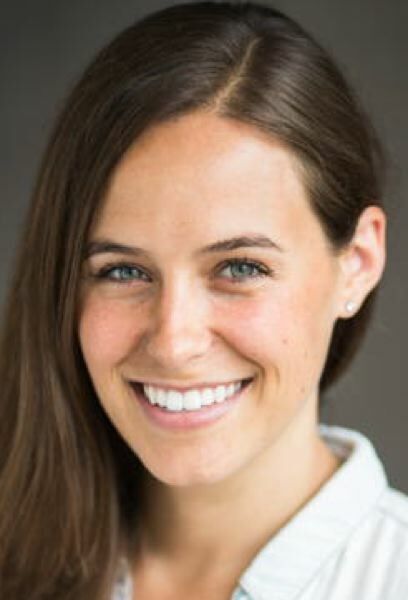 Carly Kellogg Knowles, a state of Oregon licensed dietitian and Master of Science in Nutrition, knows all about the challenges facing folks who want to get and stay healthy. "I really try to encourage all of my patients to be really gentle, kind and compassionate with themselves during this (holiday) time," Knowles, who owns Vibrant Nutrition & Health (vibrantnutritionandhealth.com), said. "Every meal and every snack is another opportunity to try something new." According to Knowles, "Balanced meals are definitely attainable during the holidays. Putting some forethought and planning into your menu can help you achieve your nutrition goals." You can start Thanksgiving or Christmas with some healthful appetizers. 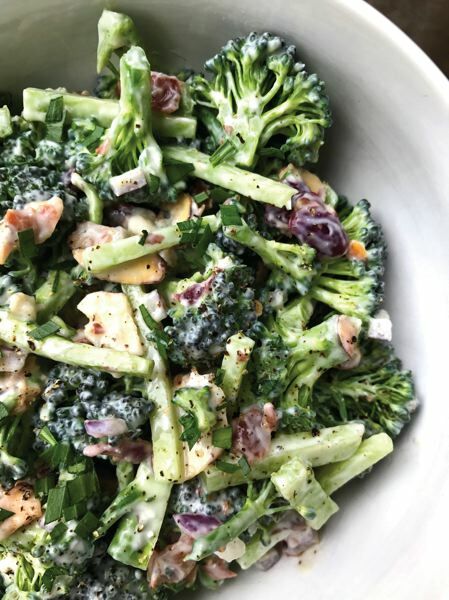 "If you're looking for a replacement for chips and dips, you can try a vegetable crudité platter that has some sort of yummy dip, that's also really nutritious, like hummus," Knowles said. "One of my favorite go tos year-round is cucumber slices with lime juice and chili salt drizzled on it, and then dipped in guacamole." Another option is baked sweet potato chips with a warm bean dip. A side dish can be prepared without all those rich and decadent ingredients. "One of my favorite go tos, and it's a recipe that I created, is maple glazed sweet potatoes and lentils," Knowles said. "It's a really satisfying (recipe is below) dish. 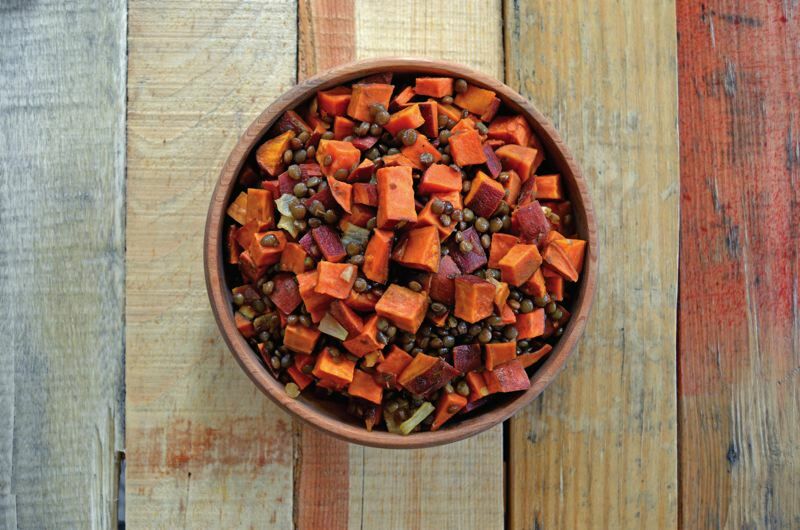 Sweet potatoes have this really yummy sweet flavor and lentils give it a little protein punch." 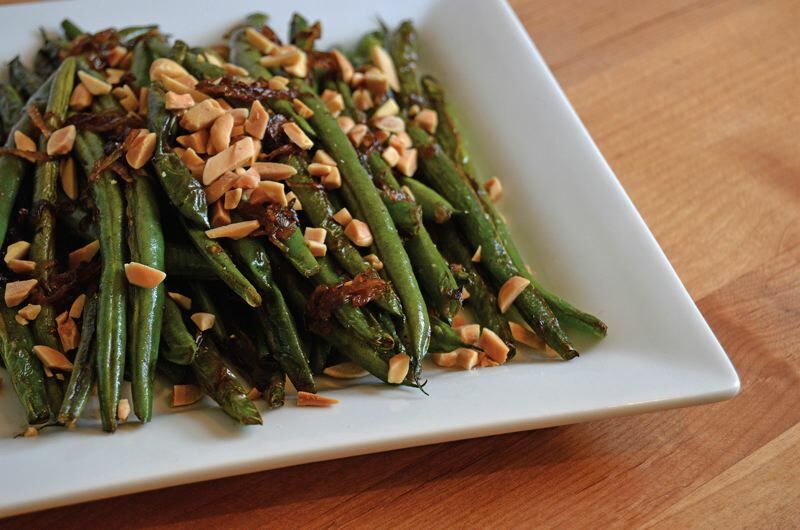 Green beans with shallots (below) is another healthful option Knowles is proud about. She said, "I know green beans aren't necessarily in season, but gosh, I can't get enough of them." You may wonder what kind of meat to serve. "I typically recommend choosing a lean protein, such as chicken, turkey or fish," Knowles said. "I really encourage my patients, and people in general, to consider making meat less of the star of their meals, and allowing some of the other foods on their plate to have their 15 minutes of fame." If turkey is your Thanksgiving favorite, Knowles suggests a non-traditional way of preparing the bird. "I've actually grown really partial to buying a turkey and breaking it down completely before cooking it," Knowles said. "Breaking it down into all its parts, and cooking it in a really yummy stock with some fresh herbs and some really flavorful high-quality olive oil (or perhaps butter), could be a really great alternative to keep it a little more moist and flavorful." If red meat is part of your holiday tradition, Knowles said, "Red meat contains saturated fat. Typically, it's (fat) what gives so much of that yummy food our flavor — saturated fat can lead to heart disease — it's not something to avoid, by any means, but there are so many great protein options out there that are leaner." Vegetarians and vegans have many choices for healthful meals. Knowles suggests a menu item with cauliflower. "One that I love, and it's so fun to serve people — is actually called a cauliflower steak," Knowles said. "I'll serve it with chimichurri sauce. You don't cut the cauliflower in little florets. You actually slice it, in very big slices, so it becomes a steak." Knowles stresses flexibility with holiday meals. "Keep in mind our pleasure and satisfaction are also a really important part of balanced eating, especially when we share space with friends and family over the holidays." 1. Preheat your oven to 350 degrees Fahrenheit. Chop your sweet potatoes into bite-size pieces, 1/2 - 1 inch cubes. Place in bowl and add 1-2 tablespoons olive oil, 1/2 teaspoon of salt, and mix well. 2. Spread sweet potatoes on to foiled baking sheet and bake in the oven until soft, roughly 30-40 minutes. The smaller your sweet potato pieces, the faster they'll cook. 3. Place the dry lentils in a strainer and wash with cold water. Pour the lentils into a small pot and cover with water at least a couple of inches above the lentils. Add the kombu and cover the pot with a lid. Bring to a boil. 4. Once your lentils have boiled, reduce heat to a simmer and cook them until soft and tender, 20-30 minutes. Do not overcook your lentils or they'll become too mushy. Once your lentils are at the desired consistency, remove your pot from the heat source and add 1/2 tablespoon of salt. Mix well. Let the lentils sit in the salt water while you prepare the other ingredients. 5. Chop the onion into small bite-size pieces to match the size of your sweet potato pieces. Spread on a foiled baking sheet and cook for ~15 minutes until softened and golden brown. 6. Strain your lentils and add them to a medium size mixing bowl. Add the cooked sweet potatoes and onions too. Mix together. 7. Add maple syrup to the mixture and taste for seasoning. Add salt to taste. 8. Transfer to serving bowl and serve hot as a side dish to your meal. Savor this warming dish with a piece of fresh salmon or tangy BBQ tofu. 1. Preheat your oven to 300 degrees Fahrenheit. Wash and prep your green beans. Remove the ends of the beans if desired. 2. Place your slivered almonds in a small circular or square baking pan and dry roast in the oven until fragrant and lightly browned, about 10-12 minutes. 3. Use a mandolin or really sharp knife to slice your shallots into thin slices. 4. Add butter to a skillet and melt on medium heat. Add the shallots to the skillet and sauté until browned and slightly crispy. Place the shallots in a small bowl and set aside, keeping the remaining melted butter in your skillet. 5. Reheat the skillet on high heat. Add the green beans and salt and cook without disrupting the beans until they blister, about two minutes. Then move the beans around in the pan until all sides are lightly cooked. You don't want to overcook the beans turning them an unattractive yellow color, so cook them fast on high heat! 6. When the beans look done, add the vinegar and cook for another 30 seconds. Turn off your heat and immediately remove the beans from the pan, placing them in a mixing bowl. 7. Add the already cooked shallots and toss thoroughly with the beans. Season with salt and pepper, to taste. 8. Plate the beans on a serving plate and sprinkle with the roasted almonds. Serve warm and enjoy! 2. Halve your delicata squash lengthwise and scrape out the seeds with a spoon (PS: you can save your seeds and roast them for a healthy snack!). Slice each long half into small half-moon shaped slices. Place in medium size mixing bowl. 3. Add 2 tablespoons olive oil, maple syrup, 1/4 teaspoon salt, and cayenne pepper to mixing bowl and toss together. 4. Place the half-moon slices on a foiled baking sheet and bake for 15-20 minutes until fork soft. 5. On a separate small baking sheet, place the pumpkin seeds and bake for about 10 minutes or until the seeds begin to be fragrant or lightly browned. Remove the seeds and let cool to room temperature. 6. Turn your oven to broil and once heated, broil the squash for 5-10 additional minutes until lightly browned. Remove from the oven and let cool to room temperature. 7. While your seeds and squash are cooling, start cooking the onion and/or make the salad dressing. 8. Add your onion to a pan and slowly caramelize with 2 tablespoons olive oil, adding 1/4 teaspoon salt towards the end. Once done cooking, let cool to room temperature. 9. Mix all salad dressing ingredients in a mason jar or another container with a lid and shake well until all ingredients are mixed and emulsified. 10. Toss the arugula and cooked onions together, and then add the dressing to lightly coat the greens. You don't want them to be soaking in dressing- just lightly dressed. 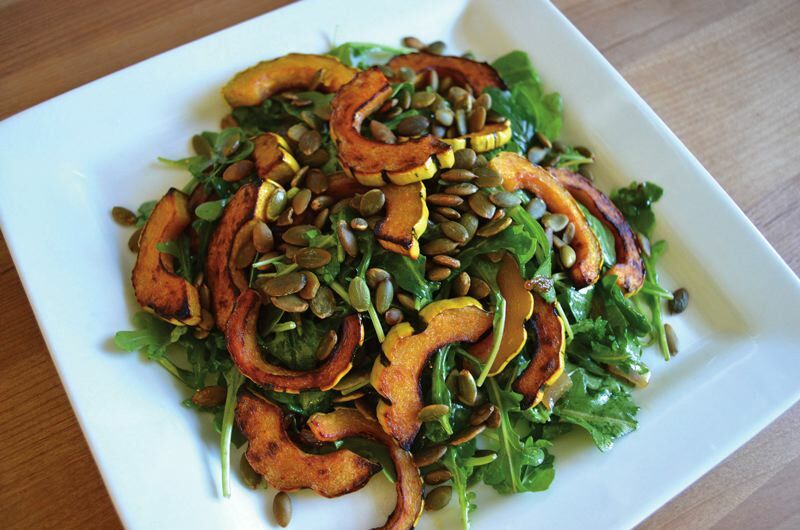 Plate the greens on a serving platter or in a large salad bowl. 11. Add the room temperature half moons to the greens and sprinkle the pumpkin seeds liberally. Serve immediately. 1. Prepare and add all salad ingredients into a large bowl. 2. Blend all dressing ingredients in a separate smaller bowl. 3. Add dressing to salad ingredients and mix thoroughly. Refrigerate for 20+ minutes until chilled. Serve cold.